Following is the list of Rosacea books that I have read and have reviewed. Hopefully my views will help lead you to some good published information on rosacea. This book is by far the most thorough and detailed reference for rosacea currently available. You will not find this material discussed with such detail and authority anywhere else. READ my full book review here: Rosacea Diagnosis and Management. Certainly when you hold this hard covered cloth book in your hand, and flip through the glossy pages with brilliant photographs you will appreciate that this is a book for professionals. This is a solid and well researched, high quality text on acne and rosacea and how to treat it. Especially for those who might be looking to lasers and other related therapies to treat their rosacea, this book is well worth purchasing. The excellent references and background information will also be valuable for any rosacea sufferer seeking to engage with their doctor on the state of the art in rosacea treatments. Read the full review here: Acne and Rosacea: Epidemiology, Diagnosis and Treatment. We can read via twitter (and in the acknowledgments) that this book was proof read by Dr. Edward Seaton. The book is written in 3 parts – 1. Acne (135 pages), 2. Rosacea (25 pages) and 3. Caring for Acne and Rosacea Skin (39 pages). Alison Bowser tells us that she was the CEO of the now defunct Acne Support Group (the ASG ceased to exist in November 2007) and herself suffered 12 years of life-affecting acne. Bowser is responsible for organising a series of patient rosacea education events around the UK and says that via the ASG has helped over 2 million people with acne and rosacea deal with the condition. The ASG no doubt helped many people over the years that it is was in existence, but I was left puzzled as to how the figure of 2 million could be realised. This claim and the subtitle of the book being a `complete guide’ builds an expectation that the book will be something substantial. Read my full review to see if the promised substance eventuates. Author: Arlen Brownstein, Donna Shoemaker. This is a gentle book. It makes very gentle claims about the broad applicability of what it has to say. The book starts off talking about the author’s discovery and subsequent distress at having rosacea. She went first for the traditional dermatologist directed treatment path. For a naturopath this is an honest admission – that she firstly thought that she need to consult mainstream medicine to `get rid of it’. Becoming disappointed with the results she then turned to her background. The introduction section follows the theme of the book – lots of gently stated facts about rosacea. The treatment section mentions the regulation treatments and then talks about naturopathy and homeopathy. The much loved ZincO even gets a mention. I’m not a fan of trying to control one’s rosacea by avoiding known triggers. This comes from a desire to be rid of the disease by not giving in and changing your life dramatically. Thus, the seemingly obligatory section on triggers and stress doesn’t really help. Next, is a short section on makeup and lasers. The remainder of the book deals with nutrition for your skin. As well as dealing with supplements, the book asks us to forget the `food pyramid’ and embrace the `food wheel’. The section on Fats and Oils is particularly detailed. This is the highlight of the book for me, information about for eg. borage oil and flax seed oil. These are often talked about in the Rosacea Support Group, especially in regards to ocular rosacea. The book finishes with some discussions about the psychology of your face, asking us to remember that we are not `just our face’. This is good advice especially for us that obsess about our appearance. Approaching the disease from the nutritional side, this book is one of the better introductory rosacea texts. Author: James N. Parker M.D. This book got off on the wrong foot for me on the front cover. Calling the disease Acne Rosacea is a step backwards for all. No one is really calling it acne rosacea anymore. It is different enough from acne that the moniker is just confusing. Further, treating rosacea it like acne may just be the worst thing you can do. The book is more of a template for `generic health researching’ than anything specific to rosacea. The information is of such a generic level that a sourcebook on the next medical topic is just a search and replace away. Sadly this is the opposite of what you find. The National Rosacea Society comes up as a PageRank of 1 on Google. As much as we chastise the NRS, they do provide a very good starting point. If people were to start their search at the #1 rosacea web site then they will be on the right track. I’m not sure the same can be said for this book. The Guidelines chapter is too short to contain anything useful. They talk about “another type of rosacea called vascular rosacea” this statement left me wondering if they had any idea what they were saying. Surely just paraphrasing the standard classification for rosacea would have been ideal introduction, especially when you are unsure of the topic you are addressing. The whole aim of the series of books seems to be to give you information that you can’t find on the well known `rosacea internet’. I have to say from my reading of this book there are scant new resources worth noting. In the end the authors would have done better to embrace what they knocked in the first few pages. A trip to google.com, drop the `acne’ bit at from `acne rosacea’ and surf the first few sites you find. After that you will be in front of this book, and have something else to do with your $USD 25. Brady Barrow’s rosacea diet has been around for a couple of years now. If you ever wanted to know what it was all about then hopefully this text will be of interest. So what do you actually get when you purchase a copy of the diet ? you get an outline of what foods are claimed to cause rosacea, and a suggested list of foods to eat. A couple of books are suggested as supporting information for the diet. Interestingly some dieting books, including an internationally well known diet is incompatible with the rosacea diet – being full of offending foods. The text contains a full listing of suggested foods to eat for 30 days. The remainder of the text of the diet is a curious collection of email exchanges from the diet’s creator and people interested in trying it. Brady points out several times on his web site that his diet is hard to stick to. The foods that you are asked to give up won’t kill you, but for sure it will take a significant amount of self control – especially for those used to a modern western diet. Brady is also clear in what he isn’t saying. The diet is not claimed to be a cure. So given that it is difficult and not claimed to cure you, what does it have to offer you ? Many have commented on the diets author’s desire to charge for the diet. One could say that people will only really value something that has some cost. This argument works for the rosacea-support group at large – many learned people have posted useful information to the group, but as it has come at no cost to list members, the value is missed. The alternate argument is that if you pay for something, you want it to work, and when you pay for it, your perceived rights suddenly expand. As the amount asked for is small I don’t see this as a real issue. To take this point further, if you read the diet, and the pages of comments on the web site, it represents a couple of years of answering the same questions for the diet’s author. Anyone who charges such a small fee, and sticks at it for a couple of years must really believe in what they are doing. I attempted to gain some feedback from anyone who has tried the diet. I collected 85 email addresses from the diet itself and the web site and asked them for any feedback. Given that the best possible result I could hope for would only amount to anecdotal evidence, I was interested in as much feedback as possible. Brady tells us that he has had more than 500 people try his diet. Although I have only tried 85 names, and over time email addresses spoil, it is at least a small sample from which to make some comments. From these 85 addresses I got 17 bounces, 1 said it made their skin awful, 6 never tried it in the end, 1 said it was too hard, 3 said it did nothing and 4 said that they had a good response and believe that the diet was what made the difference for them. Whilst the feedback was quite small the 4 good responses are an encouragement that for some the diet is worthwhile. Given that I haven’t actually tried the diet (it would require an committment I’m not willing to give), and going by the handful of comments that it works for some really searching – it could have something to offer. Will it work for you ? Well if you are really keen and willing to stick it out then you have nothing to lose. Publisher: United Research Publishers, 2000. As we all know, publications that deal with Rosacea are few and far between. I was delighted that a book specifically on rosacea was available. We will all benefit as rosacea becomes more mainstream. Those familiar with the publications and surveys of the National Rosacea Society will recognise some of the substance of the book. The NRS suggests trigger avoidance as a major contribution to reducing the severity of rosacea. This theory doesn’t sit well with those who demand nothing less than the reversal of all symptoms. The thought of going down the path of finding which histamine producing foods cause me problems is somewhat unappealling. The book has chapters on the mechanics of rosacea, ocular symptoms, diagnoses, stages of progression, theories of causes, vascular system, rosacea management through triggers, nutrition, stress, treatments and a chapter on alternative medicine. It is good to see the broad spectrum of rosacea topics addressed. The section on nutrition deals with zinc, omega-3 fatty acids, flax seed, selenium, vitamins A,C and E, niacin and water. Chapter 13 is about treatments and deals with antibiotics, tretinoin, retinaldehyde, steroids azelaic acid and a couple of paragraphs on lasers. Those looking for details on photoderm, zinc oxide, antihistamines, jojoba oil and other new treatments talked about on rosacea-support, will need to hope and wait for a second edition of the book. Thus those who have been members of the Rosacea Support Group for more than a couple of months won’t find the miracle cure that we hang around for. The book will prove useful to those starting out on their quest to beat Rosacea. It is ideal to give to someone recently diagnosed with rosacea. Something in print is easy to digest. New patients reading this book may find relief for mild rosacea and if that is the case then the book is well worth it. The publisher can dispatch you a copy from their web site. One of the joys of being a part of the rosacea support group is that people sometimes approach me with information on their experiences of rosacea. Georgie Holbrook has self published a book about her journey with rosacea for 7 years. She had everything stacked against her, many many doctors telling her that her rosacea could not be cured. Her book details a period in her life when she decided to ignore what she was being told and decided to look within and outside for a cure. Her journey is about healing, healing from the past hurts, and spiritual, emotional and physical healing for today. Encouraging us to measure our joy, to become in tune with the beauty of nature around us, self improvement, and to get in touch with our spiritual self and maker, Georgie maps a path to a holistic approach to healing. A short section of the book is also devoted to some regimes related to cleansing, exercise and diet, but this is only dealt with as part of the the whole picture. This is the strength of the book, an approach that encourages us to look at all of our lives. I would recommend the book to those who would like to explore a wholistic approach to their life. Especially it would seem that those who have past hurts and emotional scars will really benefit if Georgie’s story is anything to go by. This is purely a personal opinion, and you will no doubt find your own positive messages from the book. We all need to think laterally and open our minds to different approaches to healing. Georgie is a delight to deal with and a true friend to all us Rosaceans. The book is very reasonably priced, this is because self publishing means that you basically have to pay for the books up front before they are printed, and you take the financial risk yourself. The book is available online at her web page. Nona Says: I use Paula Begoun’s book: “Don’t Go to the Cosmetics Counter Without Me”. In it she names about all of the ingredients used in cosmetic products and what their purpose is. She is very tuned it to rosacea and what irritates it (but she is not a dermatologist and not infallible). Her website is cosmeticscop.com. She also puts out a cosmetic, skin and hair care line that is free of fragrances and other irritants like some plant oils that are touted as useful in many products. I’m new to this board, and I just want to mention that Brady Barrows updated book “Rosacea 101” which includes the rosacea diet is definitely worth the investment of $33.00 (or so). And while I haven’t finished it yet, I’ve learned so much. I recommend this to anyone with rosacea, especially people who are new to this disease (like me). Thanks for the comment Ann. Self publishing is a great thing in that almost anyone can publish a book. One of it’s problems is also that anyone can publish a book. Sadly this can make it hard to discard the less useful texts. Good luck with your readings, I hope you continue to find access to useful resources. He denounces the healthcare profession, telling us that there are so many cures out there that are deliberately kept from us because all the drug companies are interested in, is of course making a huge profit. I do wonder however, if he is genuine about his “simple” cure, and really wants to help fellow sufferers, why doesn’t he simply tell us what it is? I am always very wary of these “sites” that promise the world and give you nothing. Perhaps I am too cynical, but I’ve been caught out too many times. 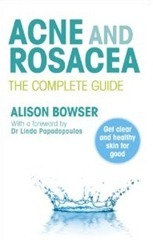 Banish Rosacea Booklet and also “Banish Rosacea” book for more information. Many thanks for such a prompt reply and for the links – very interesting reading – I may just get the book and tell you all what I think! I think of you often as we have the same mission helping people with Rosacea. I came out with a new book this year The Rosacea-Acne Natural Remedy which goes into more detail of how I healed and has many self-help chapters. After I wrote Joy-Full Holistic Remedies – I was left with some deep questions about how my rosacea got so extreme to cause my face to start deforming and near blindness. This new book covers my discoveries and the years /steps that took place before my diagnoses – very vital information. If we want to heal something / anything – let’s look at how it got created and can then be equiped in how to heal. Better understanding the immune system and whole person … not just the face. Since I’ve helped many hundreds of people with these health challenges over the years I noticed some common health issues that others haven’t addressed in looking at the ‘whole person’ and came up with a rare health evaluation that is included in this book. I’m determined that God gave me a second chance and want to give back the wisdom I’ve gained over many years helping others and my own healing.